The Supreme Court has ruled in favour of UKIP in its appeal against the Electoral Commission's order to repay £350k donated by Alan Bown in 2006. Alan Bown is English, he was born here and continues to live in England. Between December 2004 and February 2006 he was mysteriously removed from the electoral register and during that time he donated almost £350k to the party. The Electoral Commission - little more than a sockpuppet for the LibLabCon - demanded the forfeiture of the full amount and UKIP appealed. Westminster Magistrate's Court found in UKIP's favour and ruled that only £14,481 which the party accepted after being made aware that Bown wasn't on the electoral register should be repaid. The Electoral Commission appealed the decision in the High Court which ruled in favour of their political paymasters and ordered a full forfeiture. Today's ruling by seven Lords has restored the original ruling by Westminster Magistrate's Court and UKIP will only have to repay £14,481. 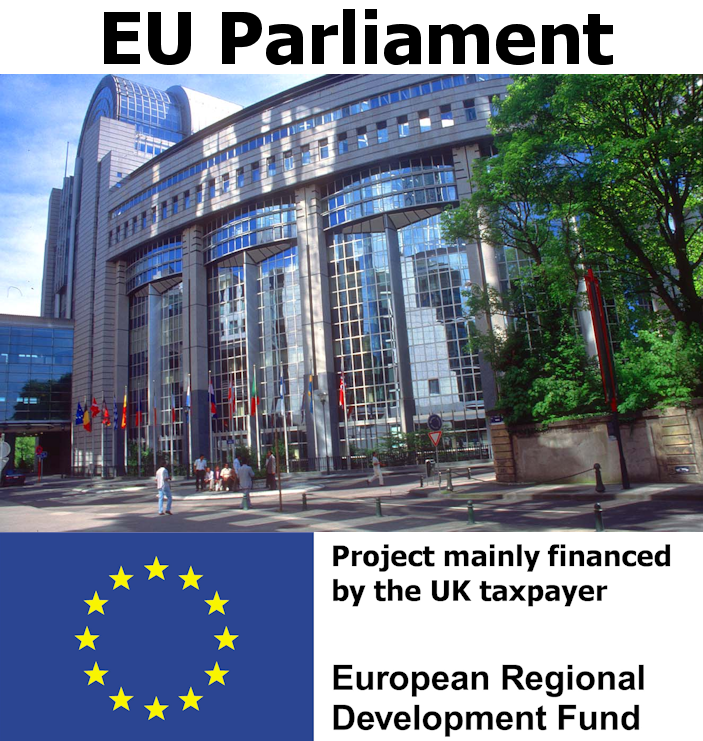 The EU government has fined the UK over £150m for not putting the EU's logo on things that the EU Regional Development Fund has partly funded using UK taxes. It's quite simple. 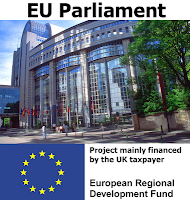 The EU gives money to cultural and infrastructure projects all round Europe and in return the EU ring of stars logo has to be displayed prominently at the site of whatever the money has paid for and on letters, leaflets and posters to do with it to advertise the generosity of the ERDF. Which is all well and good if it's someone else's money you're spending but the paltry amount of money the EU Regional Development Agency gives to the UK is far less than the obscene amount of money we hand over to the unaccountable, corrupt European Empire. In exchange for the EU giving us back some of our own money we are supposed to put up plaques and signs with the EU logo to show them how grateful we are and when we don't, they take more of our money in fines. These plaques and signs are a blight. The most inappropriate one I've seen is at Blists Hill Victorian Town on the side of some restored Victorian machinery. Incidentally, the new post office they built at Blists Hill has modern rubber flooring rather than authentic wooden flooring because of EU regulations but that's a different matter. It's about time these advertisements were removed from the sides of roads and tourist attractions, they're a blight on the landscape and a seemingly permanent reminder of our subjection by the European Empire. It's funny but some of the things Nigel said are really quite familiar. Why ask if you're going to ignore the answer? The BBC has been asking members of the public what laws they would repeal in a "Great Repeal Bill" following the launch of a new website fronted by Nick Clegg asking members of the public which laws they would do away with. I imagine that most UKIP members - and, in fact, most members of the public - would put the European Communities Act at or near the top of the list. So if leaving the EU comes out top of the wishes on this new website, we can expect the British government to start making arrangements to leave, right? After all, Cleggy says "For the first time in a long time, government is listening and we'll put the best suggestions into practice" so it's reasonable to assume that Cleggy and Cast Iron Dave are going to listen to the electorate and when it's clear that voters think leaving the EU is the best suggestion, we can expect them to do the honourable thing, yes? Presenter: You saw some of the ideas there and you know this is a very basic straw poll but it's probably resonating with quite a few people. Will you take any notice? Cleggy: Well I don't think we can scrap football and I don't think we can sort of get rid of Europe but look we're turning things on its head. The traditional way of doing things is that government tells people what to do, that's the old way of doing things. We're saying tell us what you don't want us to do. We've already made a big start. We're already scrapping ID cards, we're gonna scrap rules, these vetting and barring rules that were stopping people from just helping their neighbours children, we're gonna stop the fingerprinting of children in schools without parental permission. We're doing a lot of these things already but we want to hear more from people and if you go online it'll be the biggest online crowd sourcing initiative by any government ever and it'll really I think get the ball rolling to get people involved and to make people feel they're in charge as well. Presenter: So you get ideas in but what level of support does it take then for you to do something about it? I mean if enough people said we want to get out of Europe on that site you'd have to do something about it wouldn't you? Cleggy: No. Look, clearly as the lady said on the programme at the end of the day the government needs to decide. The key thing about this is that while ministers might be able to disagree with some of the suggestions, the suggestions will be out there. Cleggy, like so many other politicians, seems to have forgotten that they are our servants, not the other way round. They are elected to represent our interests and run the country how we want it run. If most of us want out of the EU - and we do - then it is not for MPs to decide otherwise.